Heat oven to 400°F. Spray or grease 15x10-inch or larger dark or nonstick cookie sheet. Unroll dough on cookie sheet; starting at center, press dough into 15x10-inch rectangle. Spoon apple pie filling evenly on dough. In medium bowl, mix flour, brown sugar, oats and cinnamon. Cut in butter, using pastry blender (or pulling 2 table knives through mixture in opposite directions), until mixture looks like fine crumbs. Stir in cheese and pecans. Sprinkle evenly over apples. Bake 13 to 16 minutes or until crust is golden brown. Drizzle with caramel topping. Serve immediately. A tradition in northern England, and also in New England, is to serve a wedge of Cheddar cheese with apple pie. 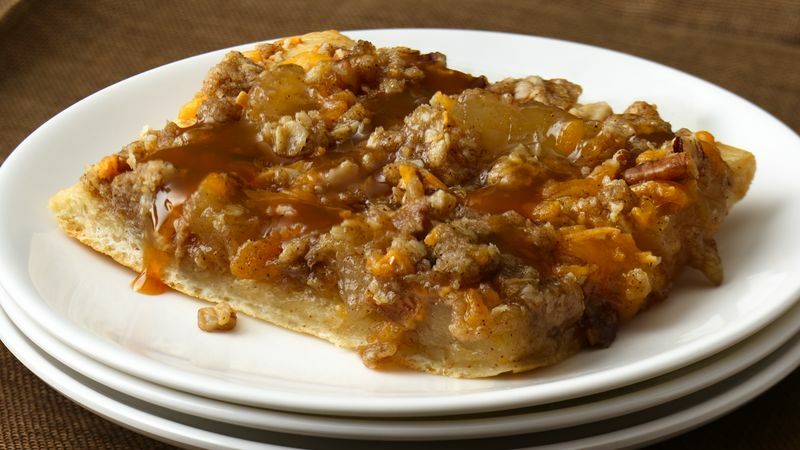 Caramel Apple Pizza highlights that flavor combination with shredded Cheddar cheese in the streusel topping.